Makerspaces are becoming more and more prevalent in schools around the world, but the skills students are learning tend to be outside of the required curriculum. And the traditional education system has difficulty recognizing student achievement and skills learned beyond the standard report card. 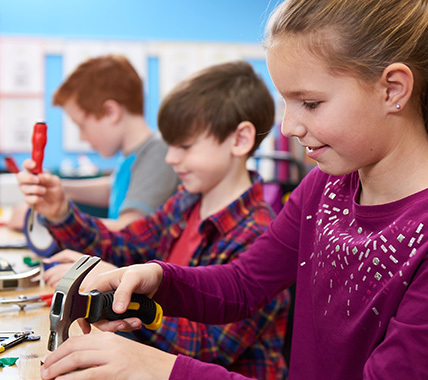 There is a tried and true way, however, to recognize student achievement in makerspaces that can benefit students and the space in the long run. At the start of the school year, I introduced a badging system to our new makerspace. The number one goal was to give students a chance to be recognized for the skills they learned while working in the space. It took time in the summer to create the initial badging system, and there is still plenty more to do, but students have been excited to earn the badges for their hard work. Here are four steps you can follow to create your own badging system for your makerspace. Think about whether you want your badges to be digital or physical — or both! My students love the physical badges to go along with their digital badges because they can stick the badges on their devices and show them off to other students. It is also great advertising for your makerspace. 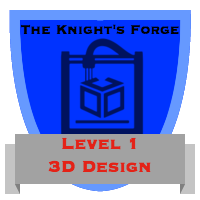 You can design the badges using Photoshop, or have students design the badges by hand if you want them to be part of the process. 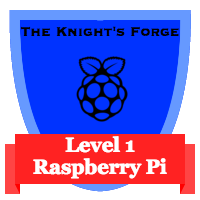 You could even create a badge students can earn for creating the badges! The badge should clearly state what the badge is for, and you can add the name of your space or the school. I keep a record of every badge earned by each student and print out the badges on sticker paper as needed. For the students, the physical badges are a nice, tangible thing they can see, hold and show off to friends and family. As the teacher, you need to determine the skills that students will likely master and craft the requirements needed to earn the different badges. Begin with what comes easily to you. For example, I have multiple Raspberry Pis for students to work on, and I have the skills to help students learn Raspberry Pi and Python to accomplish various tasks. I created badges for blinking an LED, making a button work, using a buzzer, and other simple tasks using Python and Raspberry Pi. These simple badges allowed students to dive into coding in an accessible way and earn badges along the way. The badges become more complex as students advance in their skills. By starting simple, I was able to put together multiple badges to begin the year, and the students were able to dive in and start earning them. Makerspaces should be tailored to the needs of students, and the interests they want to explore should be available to them, if possible. As students’ interests change over time, so should your makerspace offerings. To stay up to date, it is important for teachers to be engaged in regular dialogue with students to find out what they want to do in their makerspace. I started asking students what they wanted to see in their makerspace, and I learned that they are obsessed with Minecraft®. Based on the feedback from students, I created four levels of badges for Minecraft. Students were already playing the game and had the skills needed to earn the badges. The badges were a nice way to recognize the skills the students had acquired after many hours of crafting in the game. Explore tools and resources to help your students develop the 21st-century skills they need to succeed. 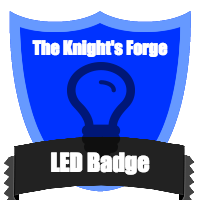 One thing I have learned about makerspaces is that you have to be flexible about what students are working on and about what is “badge worthy.” There will be times when students will want to work on something that does not have requirements linked to a badge, which is fine. Badges don’t need to be attached to everything, but it’s nice to recognize students if they do something great. I had one sixth-grade girl who saw a box on my desk. It contained a small robot that needed to be built and could then be coded to drive around. It was a gift I had not had time to explore yet, but the sixth-grader really wanted to build it. I let her, and she came in day after day during her study hall to build the robot. At one point, she was taking the robot apart and the entire bot collapsed. After a few days’ break, she rebuilt it from memory. She programmed it and had it driving around the room. It was awesome because she just wanted to build it. 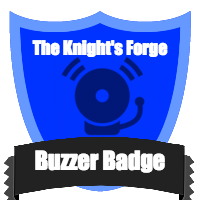 I was happy to create a new badge for her to recognize the hard work she put into the build. These four steps can help you on your way to creating an effective badging system for recognizing student achievement. I have found that announcing the names of students who earn badges and presenting the badges to students in class are nice ways to recognize the work the students are doing in the makerspace. As your makerspace grows and different interests are explored by students, the space will evolve. That might seem scary to teachers, but not to a makerspace educator. Evolution is a natural part of making, and we want to make sure we continue to recognize all of the different skills students learn during their time in school. If you have any questions about makerspaces or badges, please reach out to me on Twitter @thenerdyteacher or at thenerdyteacher.com. I will be happy to help! Known as The Nerdy Teacher, Nicholas is the Technology Coordinator and Makerspace Director at University Liggett School in Michigan, and is also a prolific author, speaker and consultant. He writes on his website, TheNerdyTeacher.com, Edutopia.org, and many other prominent educational websites. Nicholas has been featured on CNN.com, Education Week, The New York Times, and other media outlets and is the author of the best-selling book, Your Starter Guide to Makerspaces. In 2013, he was awarded the Technology Teacher of the Year by MACUL and ISTE. He is also a Google Certified Innovator, Raspberry Pi Certified Educator and a TEDEd Innovative Educator. Nicholas is sharing plenty of nerdy things on the Ideas and Inspiration site, and you can follow him on Twitter and Instagram @thenerdyteacher.